The moments in time it took to capture the 60 pictures I’m about to share with you do not even add up to one second. Some scenes were captured in as little as one eight thousandths of a second, and the longest one was a mere one eighth of a second. 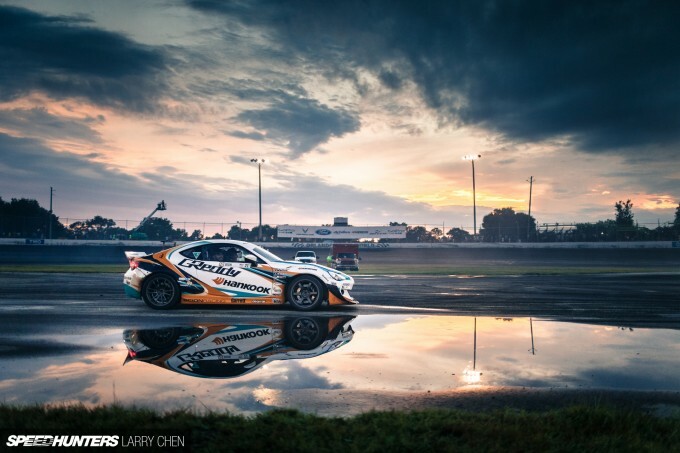 These are 60 moments in time captured through my lens at Formula Drift Round 3 in Orlando, Florida. Enjoy. 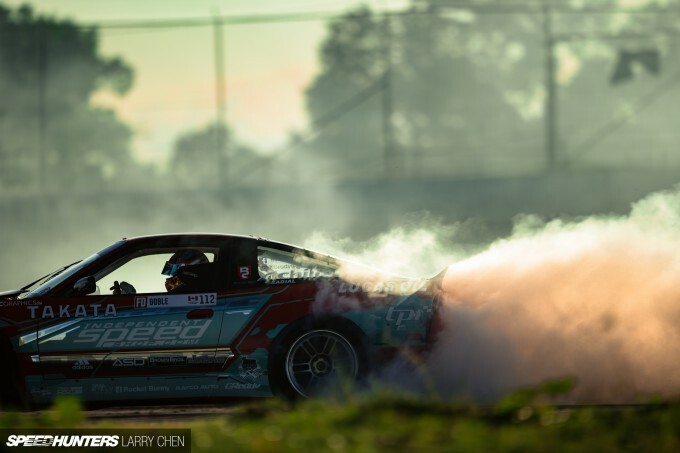 (Above) Makin’ Clouds: Formula Drift Pro2 drivers create plumes of tire smoke during qualifying. 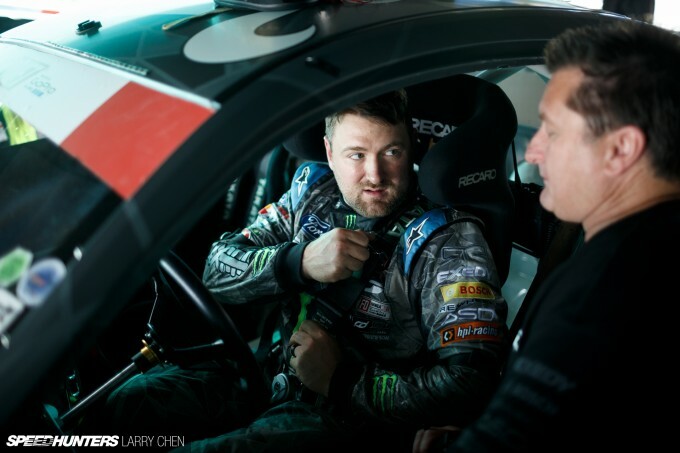 Hitchin’ A Ride: Ken Gushi generously gives Chris Forsberg a ride to the podium ceremonies. Check out Presentation Mode to see Chris sitting in the passenger seat. 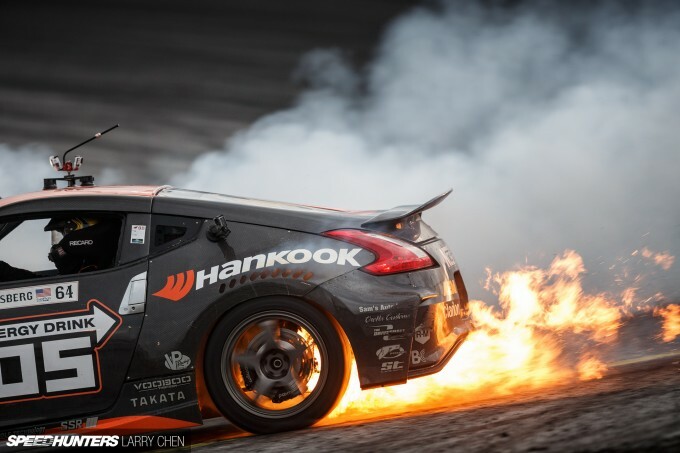 Where We’re Going We Don’t Need Roads: Chris Forsberg’s Nissan lets out a huge backfire after making contact with Ken Gushi’s Scion on the bank. 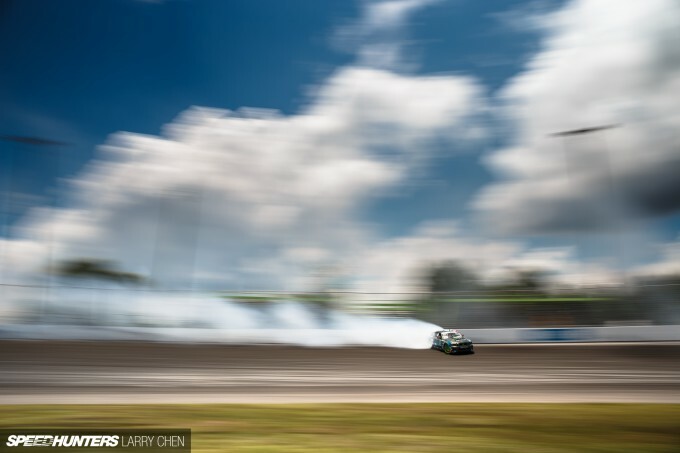 All We Are Is Dust In The Wind: Vaughn Gittin Jr. locks up his front tires as he left-foot brakes going into the final section of the Orlando Speed World course. 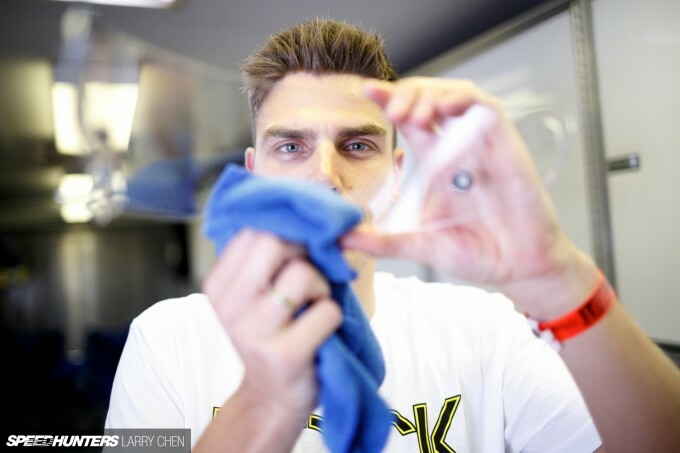 Clear & Present Danger: Fredric Aasbø cleans his helmet lens with a microfiber towel as I stare into his pretty blue eyes. Freeze Frame: James Evans gives me the closest shave I could ever ask for. The Boys Are Back In Town: You are only as good as the team behind you. 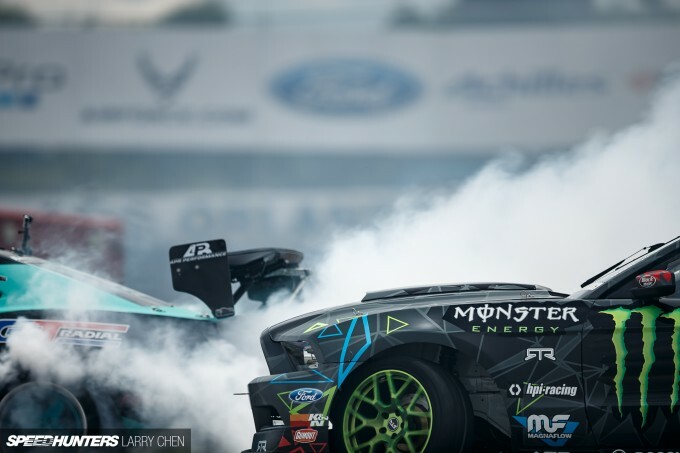 Deoxyribonucleic Acid: Vaughn Gittin Jr. follows Jeff Jones on the big bank. 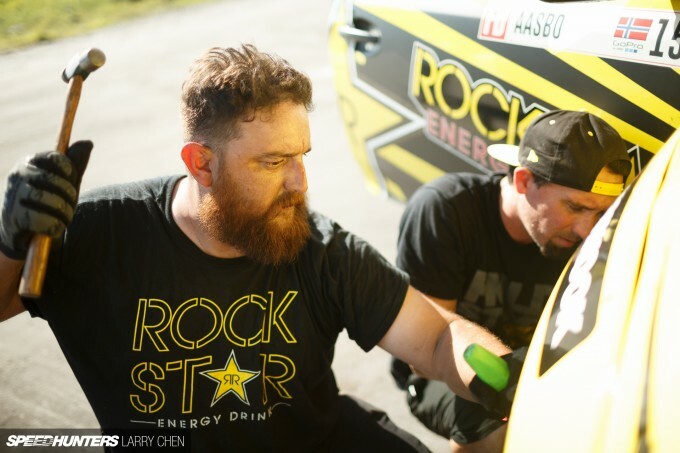 Blood, Sweat & Tears: Ryan Tuerck takes a break from working on his car after the very controversial call in the Top 32. Reflections: As the puddles dried up the boys could make smoke once again. Ride The Wall: Chris Forsberg was one of very few drivers to actually ride the wall during qualifying. Snow Plow: At one point in the event there was so much standing water I was sure some cars would shut down due to flooded intakes. I Make This Look Good: Do you know what the difference between peanut butter and jam is? Violence Is Not The Answer: Faruk Kugay is the most violent driver I have ever seen – he actually yells at his steering wheel. 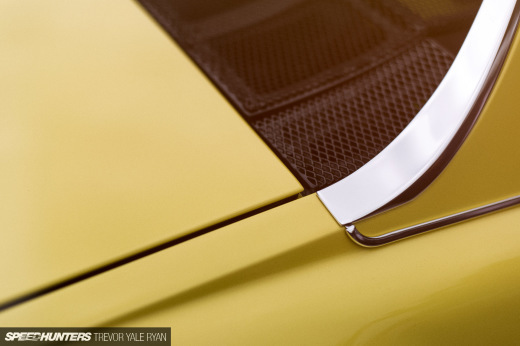 Skyline GT-R: Did you know that Daigo Saito’s R35 GT-R has three pedals instead of two? Field Of Dreams: If you build it, they will come and drift around in circles. One Eighth Of A Second: If you were wondering, this is the photo that was a 1/8th of a second pan. Foam Party: Up until this moment I had never seen anyone activate their car’s fire suppression system. It actually works! Initiation: To be honest, there were quite a few less wrecks than I thought there would be in Orlando. The walls don’t lie. Smoke ‘Em If You Got ‘Em: Alec Hohnadell had a real break-out performance this round. He’ll definitely be one to watch in coming events. 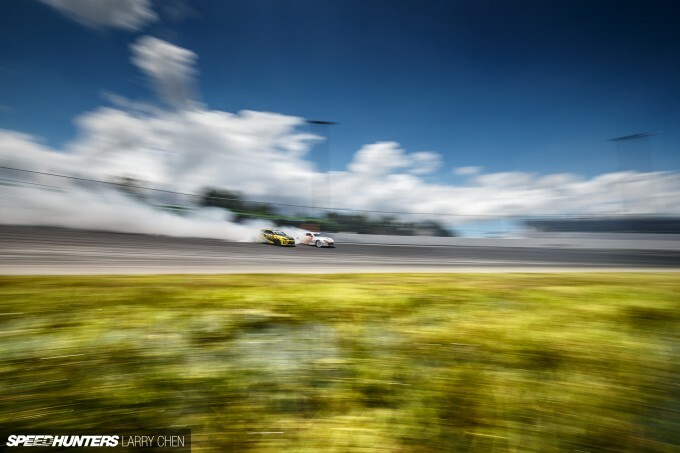 The Norwegian Shadow: Fredric Aasbø didn’t have the greatest result at Orlando, but he is still in the running for the championship, and that’s the important thing. A Pull Of The E-Brake: In regular road cars, the parking brake – also known as a hand brake, emergency brake, or e-brake – is a latching brake usually used to keep the vehicle stationary. In drifting it serves a different purpose. 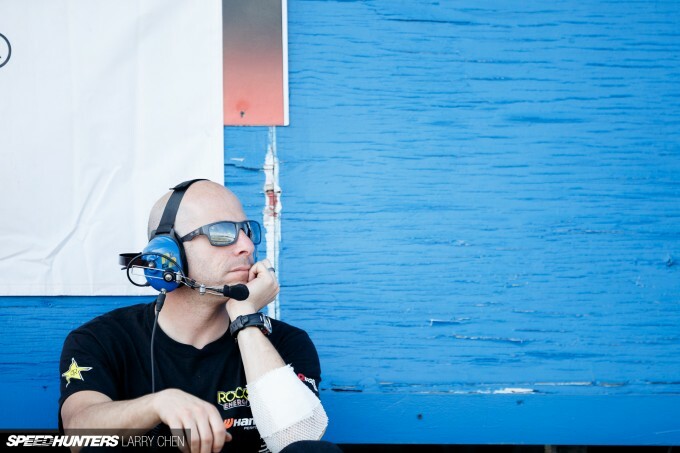 Spotters Tower: Fans rarely understand how much of an important roll spotters play in drifting. One Man Band: Ryan Litteral enjoys a cigarette as he changes his tires before qualifying. 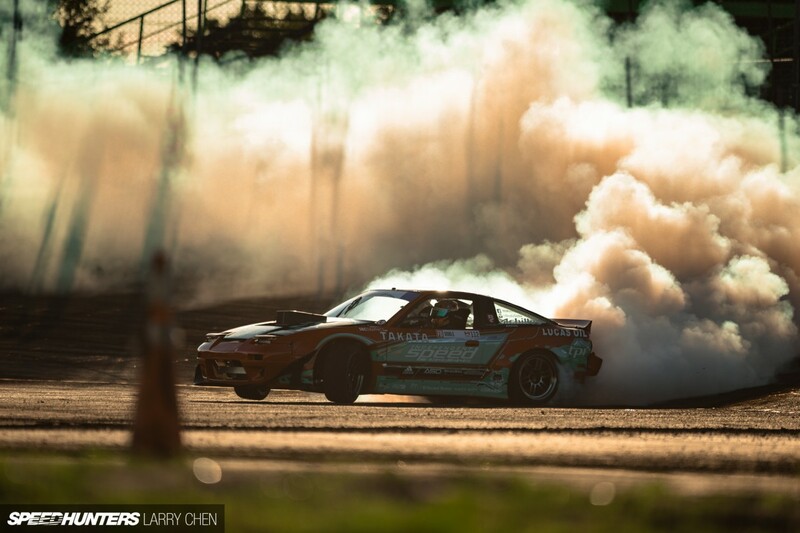 Spoiler Alert: Who says aero does not come into play in the drift world? 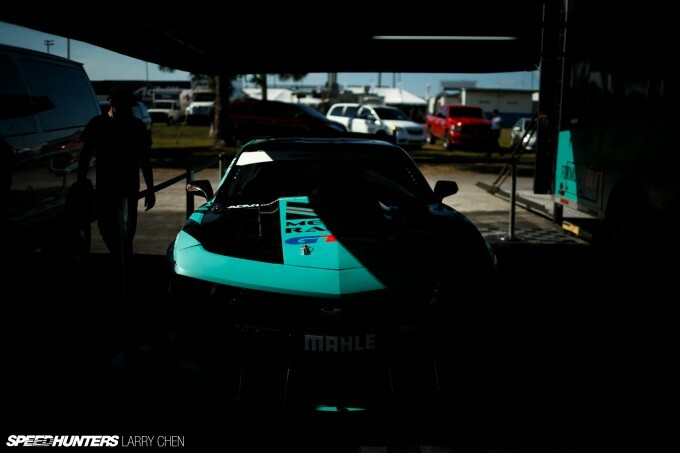 Teal & Blue: Even though Falken is playing a smaller roll in Formula Drift, they have more cars on the grid than in years prior. 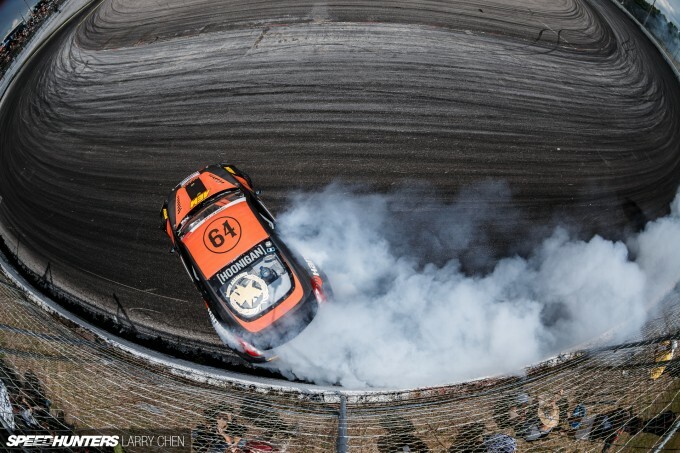 Light Play: Conrad Grunewald is one of the few traditional racing drivers who line up on the Formula Drift grid. 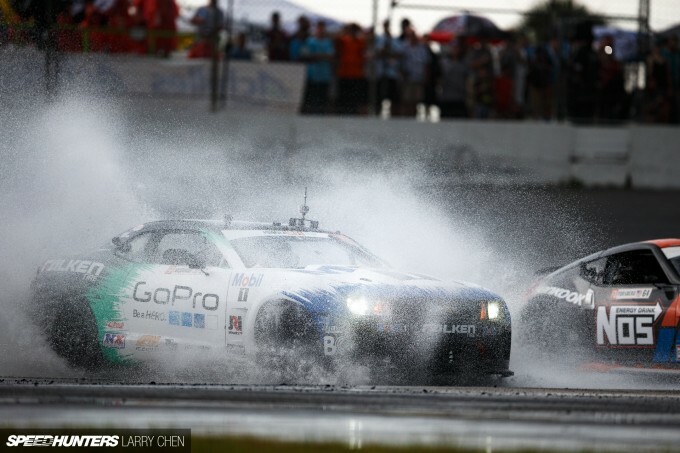 Slippy Slidey Racin': In 2014 almost every Formula Drift event had some rain. Hopefully it’s not like that for the rest of this year. 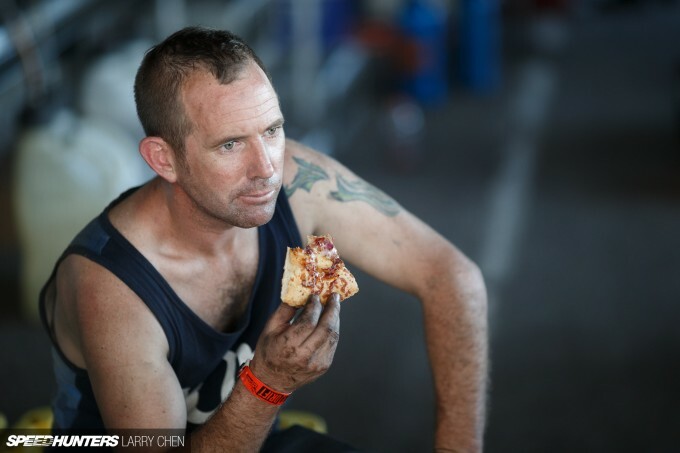 Staring Off Into Space: The man behind Mad Mike’s rotaries, Warren Overton, has a side of pizza with his grease? 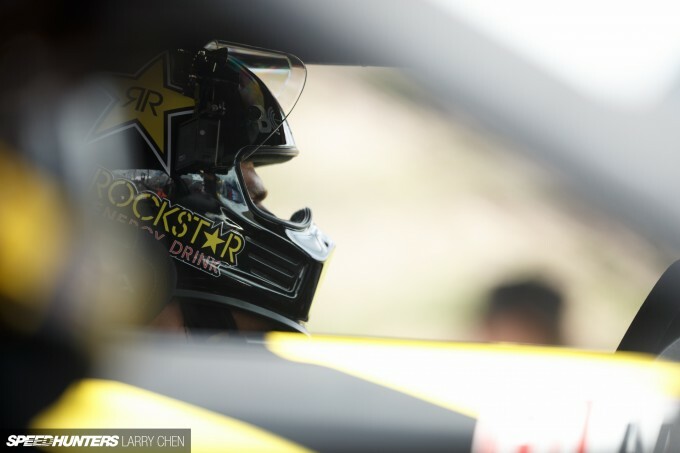 Body Damage: Ryan Tuerck’s drift car was beaten and battered, but still had plenty of life left in it. The Norwegian Hammer: Sometimes Aldo Villagran has to borrow Fredric Aasbø’s hammer in order to fix some damage. Headlights: Every time I see Vaughn running without his headlights on I tell him to hit the switch, because otherwise the Mustang looks like a black hole. Three Wheelin': It was pretty hard not to get on three wheels going into the infield due to this horrendous dip on the track. 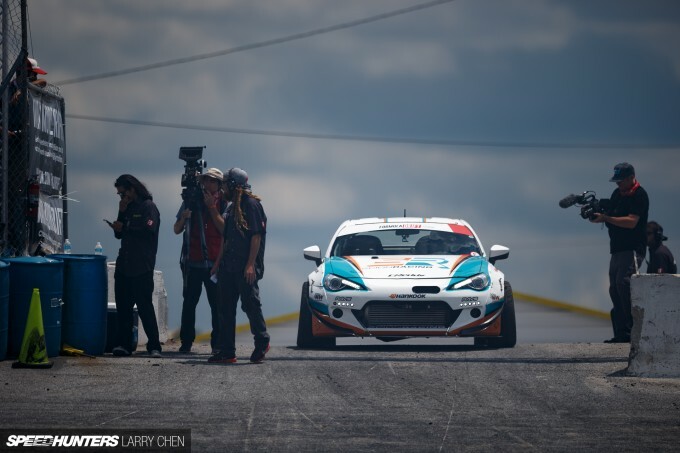 Not A BMW: Could Alex Heilbrunn be the next Mike Essa? Three Wise Men: I’ve told you guys before, but all the Japanese guys always sit next to each other during drivers meetings. We call it ‘J corner’. Cloud Hunter: There are never clouds this cool in Los Angeles, so I can go a little overboard with the fluffy balls of white and grey. 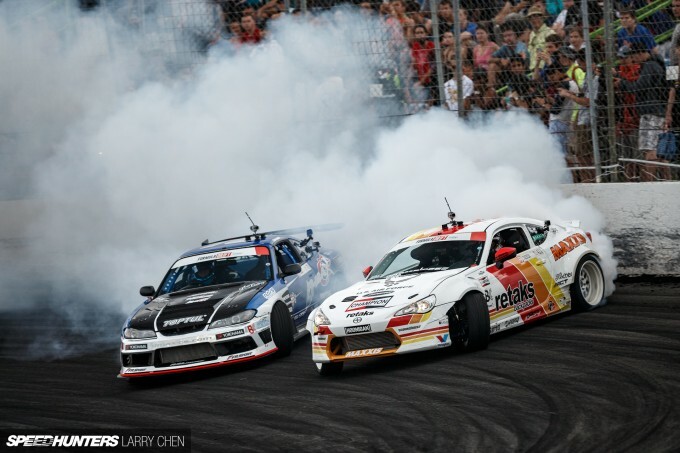 Tandem: If you don’t think tandem battles are close right now, go and watch some YouTube clips of Formula Drift from 10 years ago. Wall Love: Why would you ever need a camera that shoots 1/8000th of a second? This might answer your question. 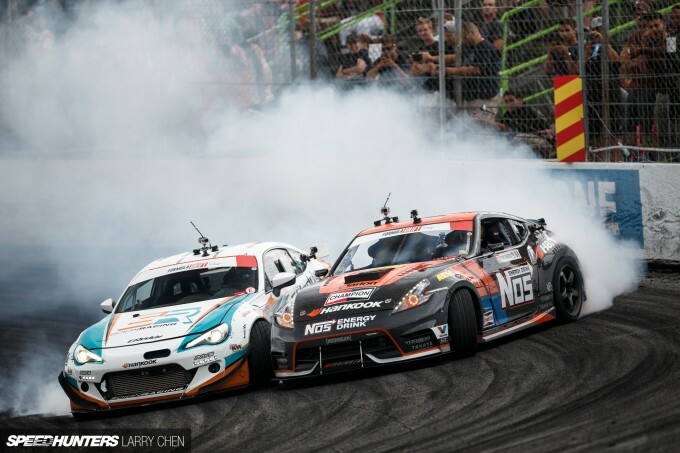 Door To Door: When the Top 32 bracket was first introduced in Formula Drift there were barely enough cars to fill the field – let alone provide for some good battles. Things have changed so much in just a few years. 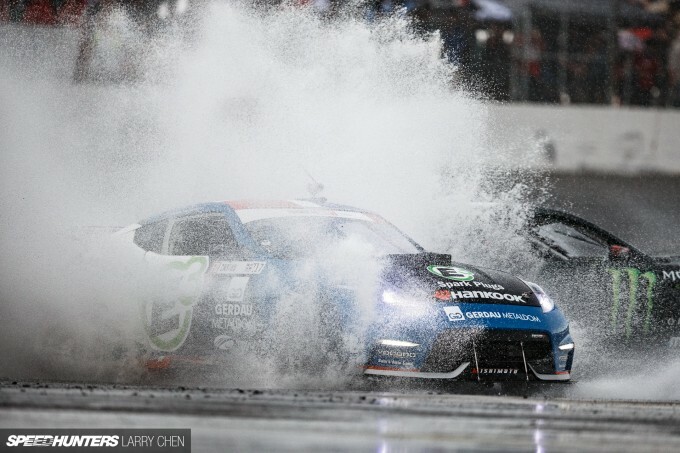 Blow Tie Versus Blue Oval: Could American drifting be any cooler than Camaro versus Mustang? Attack Of The Purple Cars: Chelsea DeNofa just can’t seem to cut a break. He is such a skilled and aggressive driver – if only his stuff wouldn’t break. Daigo’s Translator: Robbie Nishida has long shaken off the image of just being a Japanese translator. It’s just too bad his car keeps running into mechanical issues. 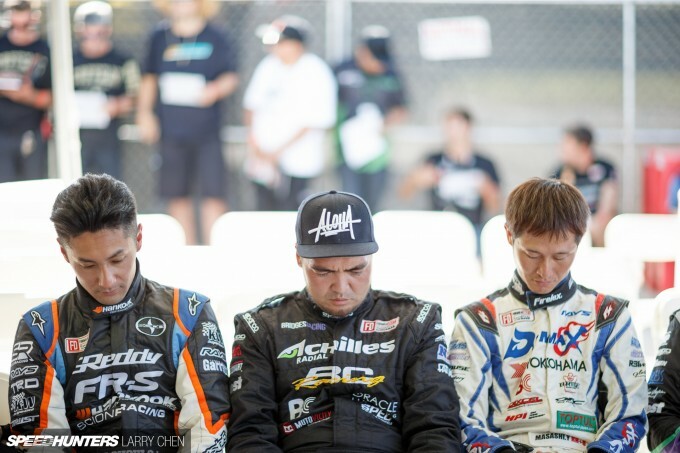 Championship Implications: It seems Masashi Yokoi and Fredric Aasbø have it in for each other. The Japanese driver was out for Norwegian blood at Orlando. 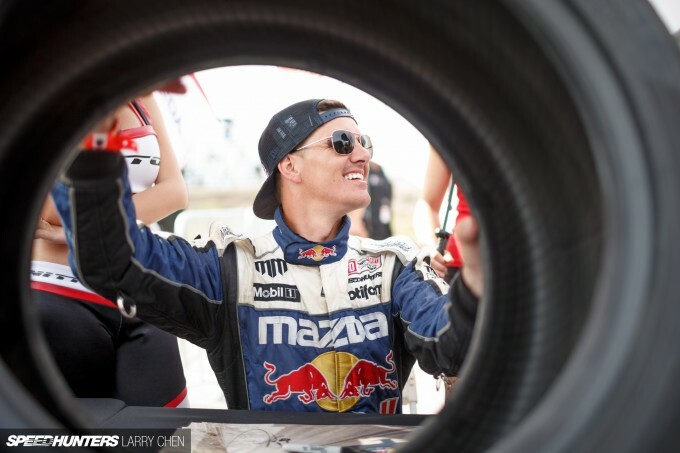 The Gush: Ken has really made heads roll recently with his back-to-back podiums. Lets hope it continues that way. Nice Office: While it’s awesome to be a racing driver, I just can’t imagine sitting in an oven all day long wearing a race suit. Free Shower: If only the sun had came out, these splash shots would have been 10 times cooler. Engine Noises: Did you guys know that Mad Mike makes the best engine noises with his mouth? Ask him next time you see him. 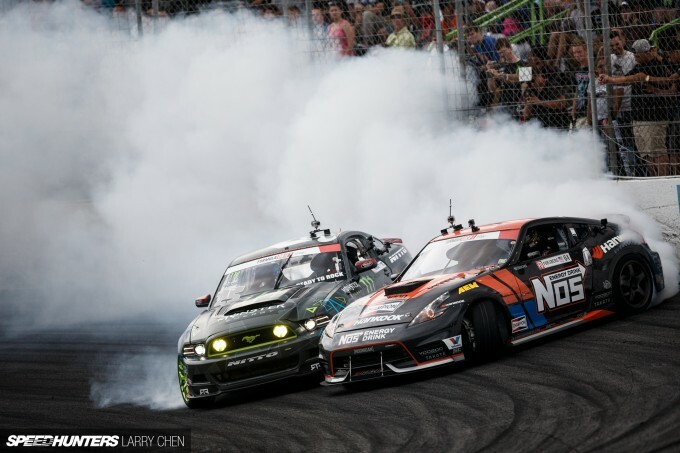 Best Friends Forever: It’s always fun to watch these two Drift Alliance bros go toe to toe. Too Many Cooks In The Kitchen: Sometimes it’s better to take a step back and let the pros do their work. 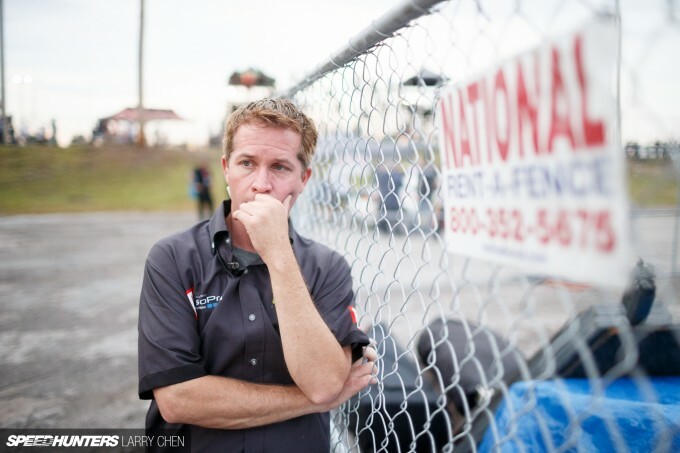 Tick Tock: Kevin Wells – Formula Drift’s technical director – times the five-minute calls. First Podium: Do you guys think that Yokoi could have won the event if his car did not catch on fire? Little Puffy Clouds: I can only imagine how many tires the entire grid goes through a weekend. I’m guessing at least 1000. 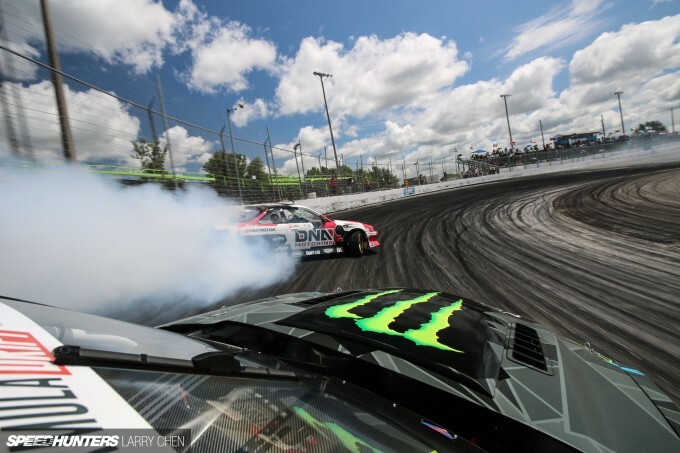 Victory Lap: Chris Forsberg could not show up to the line so Ryan Tuerck took a lap for the fans. 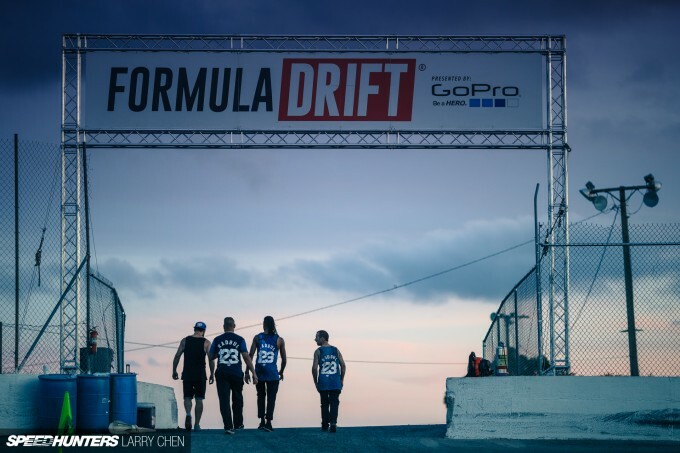 FD On Ice: Who wants to see Formula Drift on Ice? I know I do. Free Swag: I wonder how many pounds of swag is given out at each Formula Drift event? My question is, what do people do with all those used tires anyways? 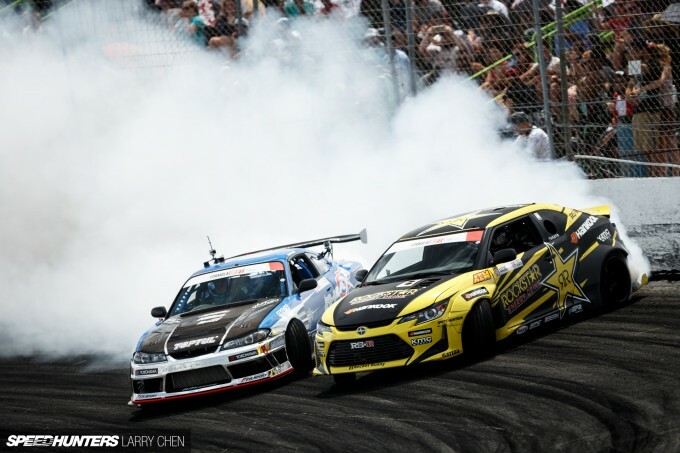 Close Battle: How crazy would it have been if Ken Gushi knocked out Chris Forsberg like he did in Atlanta? Sometimes it’s better to be lucky than good. Ryan had the bracket and calls in his favor. I just hope this season will have a super-close, five-way championship battle like it did back in 2011. Don’t you guys? As a Hobbie photographer, I need to ask. 1/8th is an incredibly long time to pan a shot, is there any tricky techniques that you use to get such a sweet shot? Or is just a lot of practice and a little luck? Top work as usual. The first two images, along with the 1/8th second pan are the standouts for me. 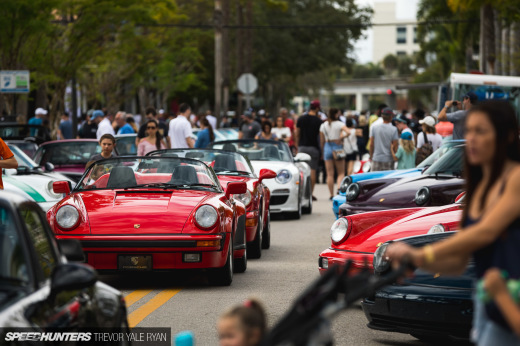 Which leads to my next question (which I meant to ask on your stunning 'art of street racing feature'); How ruthless are you on sharpness when it comes to shots like this? When I've shot similar images, I often find that while the car looks sharp in the RAW preview, once I zoom in to 100% at about 4000px wide, it's not so good, so I bin them. The images would probably look fine on the web, but should they be printed, or viewed larger they usually fall out of my acceptable sharpness range. Am I being too pedantic? Great work as always Larry. Larry! Amazing images, I'm the kid who said whats up to you at the end of top 32. Your work is unbelievable man! @Tom I would call that "standards". Keep them. Stunning work Larry ! Is there a way to get those images in 4K ? This is why I love you, Larry. Awesome. mid7production wow, that is really cool! AdrienL Unfortunately at this point no. It's bad enough as it is right now with companies stealing my photos for profit. oldschoolcat I think they were either on their phones or they were resting from the jet lag, haha. @Tom You are your own worst critic, and it's really good for you to be a stickler about your own shots. I do my absolute best to only post photos that are tack sharp. Chris 'Haffy' Hafner It's like a golf swing, you just have to practice to make it perfect! crispykrem3 You are probably right. Chris 'Haffy' Hafner I'm not nearly as good as Larry, not even close, but here's what works for me: Plant your feet shoulder width or wider apart. I keep my elbows folded into my sides (with camera up to my eye) and move my body at my hips, trying to keep my upper body level and just move left to right (or vice versa). I also breathe all the way out before taking the shots so that my breathing doesn't cause the camera to shake. Take 3-5+ shots with AI Servo mode and set to continuous shots. Fire away and hopefully you get a keeper out of the set. Here's a few from me using that technique. The first was at 1/15 at 127mm. Mad Mike and Kyle are doing us rotor heads proud. 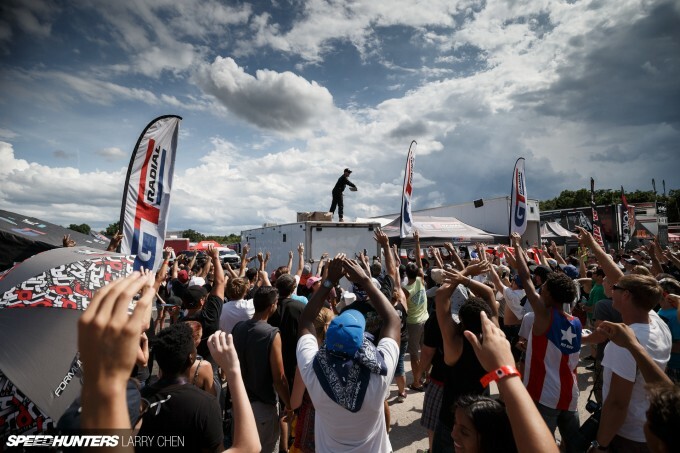 Can't wait to see mad Mike at goodwood in just 3 days!! For Mazda fans it's going to be epic, as the fleet of now historic rotarys tear up the goodwood hill. Hoping the goodwood central sculpture will hark back to Mazdas significant race past, but guess it'll be "sculptured" around the new mx5. You know, the one that should have a rotary in! Pete the perfect pilot I am so jealous. I totally need to do Goodwood one of these days. Who's the driver of the car in the three-wheelin photo? The car is absolutely gorgeous and I'm trying to find some more screensaver material. As usual some incredible photography Larry! @Larry Absolutely mate, lots of practice and I've seen improvement in my work. While I try to get to as many events as I can, if I don't get the chance for a while I do see a drop in quality. The more regular the outings the better? @Bridges. Cheers for the tips mate, have been doing something similar for a while but the breathing thing is new. Haven't been tucking my arms in due to having a big (and heavy) lens which after a while can get a bit tedious on the biceps. Those shots are great mate too. Here's a few I've taken while panning. The 911 at 1/100 and the R34 at 1/160 so as you can see a little faster shutter works for me but I'd love to get Larry good at 1/8th! So yeah criticism is ok, tell me what I need or don't need, I'm interested what people think! Beautiful shots as always, Larry. What's your secret for those super smooth panning shots? Are you on a tripod or monopod, or are you just that steady? Go follow @bwicknick on instagram or myself @drift.bum as we always post photos of the car. 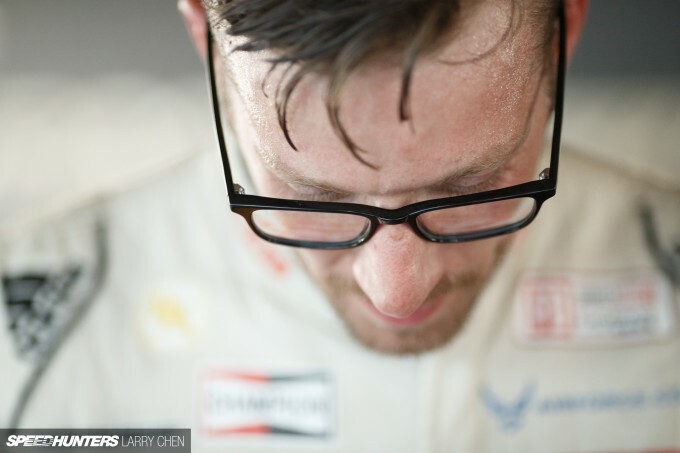 Remember when Larry did a write up on day two or Road Atlanta? Me neither. Chris 'Haffy' Hafner In my eyes, these are all good and sharp. Awesome selection of cars and you can definitely see the motion in your shots. Things that pop out to me: Horizons aren't level in the 1st and last photos (kind of subjective tho). Cars are very centered in all of them - would like to see the car "move" thru the frame. I usually use center AF point, then crop later to put the car at one of the "rule of thirds" points. You may also want to vary your perspective between wide and tight. I usually bring a telephoto and a wide angle lens with me to get both. You will use the telephoto more, but sometimes catching the environment can be really cool too. Of course you may have plenty of shots like I just described, I am only seeing three of your photos. They look great man, keep up the good work! I did four posts from Atlanta. How many more do you want? Haha. MARMALADE! What's the difference between Jam and Marmalade...the correct answer is you can't marmalade your *$%@ down a @$^*'s @%$#*( ! BAHAHA! Cheers mate, will try those tips! MichaelCapen There's not really much point in adding this information, because unless you were standing shoulder to shoulder with Larry at the exact moment the photo was taken, with the same body / lens combination, the settings will rarely be the same again. You're far better off trying to break the image down into why you like it and how you think it was achieved. It's not witchcraft by any means, but Larry's eye for seeing things different is what sets him apart. I tried a 1/8th myself today. 2nd picture for me...an absolute beaut!!! stikid09 I like it, and you can tell it's no BS because of the cones that turned into ghosts. KamenBurton It's honestly like a golf swing. Just practice and anyone can get it. Bridges Chris 'Haffy' Hafner Very good tips. Also try manual focusing guys. Don't limit yourself to the AF points.